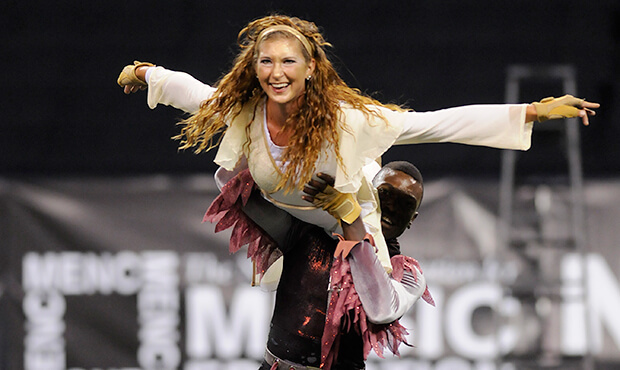 The 2011 Drum Corps International Tour started with much excitement, as Carolina Crown edged the Cavaliers, Blue Devils and Cadets in the first competition of the summer by just over three tenths of a point. 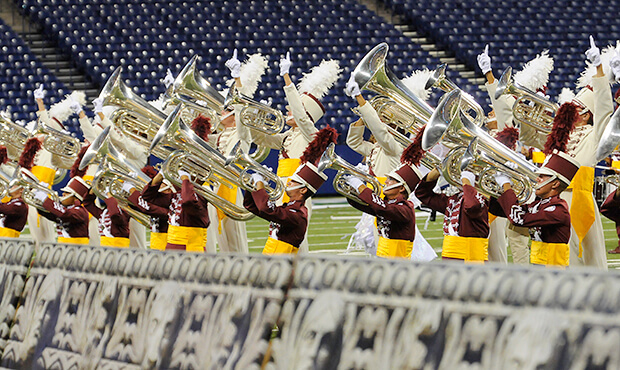 Though the Cadets finished fourth at that first show in June, come August the Pennsylvania drum corps won all four of the final competitions of 2011, ultimately bringing home its 10th title at the DCI World Championships in Indianapolis. As part of the corps' captivating "Angels and Demons" show, two contrasting and conflicting forces of good and evil interacted and repelled each other as soon as each side came out of opposite tunnels. Each division was dressed in the corps' traditional uniform, except for the color scheme. The brass, percussion and color guard performers representing the angels wore creamy white (the historic color of the corps' pants), and were the epitome of being prim and proper. The performers representing the demons wore maroon (the historic color of the corps' jackets) and demonstrated utter disrespect as they entered the field. 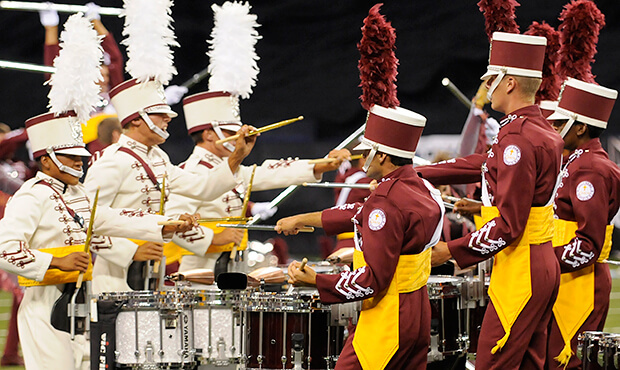 The corps' traditional color scheme was maintained with the front ensemble and drum majors, each which had to contribute to both the good and evil sections. During the entrance, one of the demon characters tossing a baritone horn halfway across the football field never failed to generate enthusiasm from the audience. That instrument had been run over by a vehicle during a rehearsal earlier in the season, and out of that calamitous accident was born an action that set the stage for the entire production to follow. It was one of the most fortuitous acts of kismet in drum corps history. The production officially began with "Opening," based on Frank Ticheli's "Angels in the Architecture." Kingsway International, a tour company providing international travel opportunities for music groups, commissioned the piece for a massed ensemble of Australian and American musicians at Australia's famed Sydney Opera House in 2008. Ticheli, a professor at the University of Southern California, conceived the work much as the Cadets approached the show, as "a conflict between the extremes of human existence?”one divine, the other evil." I am cloth'd with Mother's love. And lead them to the promised land. Often throughout the production there was no mixing of the two factions, but sometimes they intermingled alternately. According to Cadets director George Hopkins, every time the two forces (with the different colored uniforms) were intermixed, the story of the angels and demons was put on hold and the corps played straight-ahead drum corps. The second feature was titled, "The Demons Take the Lead," and was based on Hans Zimmer's "160 BPM" from the 2009 film, "Angels and Demons." Zimmer, one of today's most popular composers for film, wrote the work in a fast 7/8 meter, which in itself presented many marching challenges. Along the way, the demons taunted and terrorized individual members of the angels' side, and each faction passed through each other but never really mixed. The following section of the show was "The Angels' Turn," based on "The Doxology (Old Hundredth)" from the 1551 edition of the Genevan Psalter, a Protestant Swiss hymnal. Loys (Louis) Bourgeois wrote the melody and in 1674, Thomas Ken penned the lyrics most known today, which begin with, "Praise God, from whom all blessings flow." The demons attempted to play the lovely chorale, but just couldn't bring themselves to be nice, falling into dissonance with chords quite out of character to the piece. The demons formed a pitchfork drill formation and carried it away from the advancing angels, who had formed a giant set of angel wings while playing Frank Ticheli's 1998 rendition of the spiritual "Amazing Grace." Both factions came together for the big climax before once again separating, and a demon member of the color guard lifted high an angel member as if tranquility had been achieved, but then unceremoniously tossed her to the ground. Ticheli's "Angels in the Architecture" returned for "The Finale." The angels and demons began to mesh together in a single large arc, and as an angel with extended wings took center stage, the big arc morphed into an advancing company front, demonstrating that the demons were being won over to the side of virtue and spiritual enlightenment. As a heroic rendition of "The Old Hundredth" was played, a bank of large church bells rung out a proclamation of victory over evil, as white banners like rays of the sun spread across the back of the field. A dizzying array of drill evolutions flew by in rapid succession, ending with a final meshing of the angels and demons. The angels put their hands on the demons' shoulders, pushed the demons to the ground in submission to goodness, and raised their left index fingers to the heavens for the final loud chord. A single demon ended off in the far corner by himself, unrepentant and unsaved. Earlier in the season, we were told the demons might occasionally win, but then something happened to change that possibility. According to Hopkins, people had experienced intense emotions while watching the show and would be devastated if the angels didn't win. One man came up to him in tears after a performance, admitted he was an atheist, but proclaimed he had an intangibly profound experience at the end of the show. And with the realization of how the show was affecting people, the angels never had to worry about coming in second place. For this week only, you can save on the DVD or Blu-ray set that contains this complete Cadets performance, along with all finalists from the 2011 DCI World Championship. Buy the 2011 World Championship DVD set. Buy the 2011 World Championship Blu-ray set. Discount offer ends Monday, March 23, 2015.